At a time when consumers, advocacy groups and regulators seem to be more vigilant than ever about consumer data privacy, a new study by Google and the National Research Group (NRG) finds a significant number of consumers are willing to share some of their most personal data with voice assistant technology in order to have a more personalized media experience. While it may make sense that nearly half (46%) said they are willing to share their media consumption history, more than a quarter said they also were willing to share such sensitive personal information as their location history (29%), purchase history (28%) and banking information (27%). Interestingly, a much lower percentage of consumers said they were willing to share their social media history, which is something that would have been taken for granted just a couple of years ago before society became aware of transgressions like Cambridge Analytica's and others' exploitation of Facebook users data. 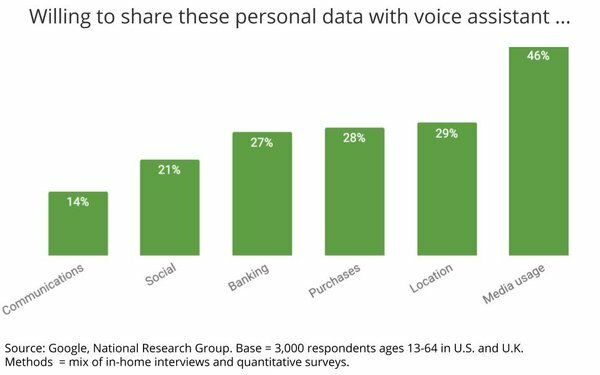 Personal communications were the least likely data to be shared with voice assistants in order to enhance each respondent's personal media experience. The No. 1 reason consumers are willing to trade data for more "frictionless" media navigation is the paradox of choice, according to NRG's researchers. "Search is a huge challenge when it comes to content discovery," the report found, adding: "In a world of peak content and overwhelming choice, voice can be a media butler that cuts through the clutter with accuracy, contextual relevance and curation. In fact, the ability to find and play content easily and quickly and make relevant content recommendations drives overall user satisfaction with devices."